Well sadly this is very probably the last Christmas card I'll get to make this year, I really enjoyed making this little 5"x5" card using Amanda's Gingerbread men digi (available free with this months news letter) and one of the papers from her lovely GINGERBREAD PAPER PACK. After overlaying the gingerbread men on the backing paper I printed out the whole card and cut away most of the card from behind of the gingerbread men, I then cut the bottom of the card with decorative edged scissors and overlayed it onto a strip of bright red Mirri card. Inside the card I added a strip of bright green paper and edged it with gold peel offs so that it backed the gingermen. The "Merry Christmas" sentiment was made using an art package, I cut it out and added it tot the card using foam pads then went over the letters, eyes and buttons with clear Sukura to make them glossy! Digi stamp - Amanda Marks. Well it's nearly that time of year again and I'm still making cards to send out as I go along, you would think by now I'd have got into the habit of making my cards earlier on in the year - but NO!! I coloured him digitally and used little dimensional eyes that move when you shake the card and added Glossy accents to his buttons, the 3 little punched red dots and the holly berries. I really like this little 6"x6" simple but effective card and hope you do too. Well it's almost Halloween again, so what else would I make but another Halloween card! I really enjoyed making this 7"x5" card using Amanda's Digi orange Web Background and Mrs. Frankenstein Digi. I matted the background onto black card then went over the whole of the web with a glitter Sakura (which sadly doesn't show up in this photo) I added a web peel off in the top right hand corner then coloured over a piece of white card with various Promakers in autumn colours, punched out some small leaves then added them with glue and foam pads around the edge of the card. The Owl image was coloured with Promarkers and postioned with foam pads as was the plastic spider and finished off the card with the "Boo" peel off! Digi Stamp and Background paper - Amanda Marks. Image coloured with - Promarkers. Peels offs - Hot Off The Press. I had a go at making some 6"x6" Halloween backing papers for card making and thought I'd share them with all my blogger friends. Simply LEFT click on one of the pictures above to open the JPG then right click on the opened image to save it to your computer. I really had fun making this 5"X7" Christmas card, The tree was made from a template by HOTP, the sentiment inside the card was cut freehand, matted and stamped, the little Christmas and Santa owls are of course from A.J's Digi Shoppe and available HERE . Owl Digi Stamps - Amanda Marks. Digi's coloured with Letraset Flex. Sentiment stamps - Personal Impressions. Various peel offs and gems for the tree. 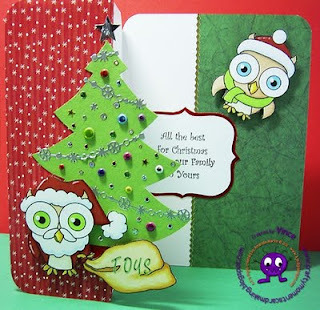 I've also added my card to Fab's Big Christmas Cards Challenge ! Yes I know it's still only August but it's never too early to make a head start on your Halloween cards, I always have fun making them. I picked the paper I wanted to use first so I was able to colour the owls to match. Amanda's Mr & Mrs Frankenstein Owl Digi Stamps are so cool and were great fun to colour, you can find them HERE with many others. 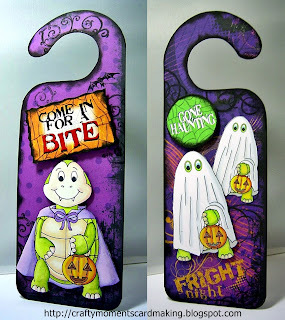 Fab has also featured this card on his Halloween Card Making Blog challenge! Background papers - We Memory Keepers - Halloween pack. Here are two more projects I made using a couple of the wonderful new images from A.J's Digi Shoppe. I had great fun making these, Dagas Ballerina is so cute and Amanda's son dress as Uncle Sam is a hoot!! As a kid I used to love to go fishing for newts, sticklebacks and tadpoles, so I thought this would make a cute card topper, I haven't had the time to do anything with it myself but please free to download him and have a go at colouring him yourself. There are 2 sizes, two coloured and two uncoloured in PDF form HERE. In the late 1960s my stepfather bought my mother a tiny handmade felt mouse which is about 2" high, I thought she'd make a great card topper so drew her and made this card from the sketch. I've uploaded her as a PDF in 3 different sizes (coloured and uncoloured) if you'd like to have a go at colouring her yourself, you can download her HERE. I thought this paper matched the image perfectly so coloured the Ducky to match. Amelia's showing off her new beads! I needed an image of a ginger haired girl with a gift box, couldn't find one so I drew one instead. There four images in two sizes coloured & uncoloured (So you can colour her any way you want to) on an A4 sheet for you to play with in PDF format HERE. This is a little card (4"x4") I made using 5 different sized circle punches for the ears and eyes and the corner of another punch for the nose. The head was cut freehand and the mouth drawn on with black marker. I do so love her work, please go and have a look at her blog if you haven't done so already.